The Society for Libyan Studies offers a variety of different grant schemes to support primary research in Libya and the broader North African region (Morocco, Algeria, Tunisia, Egypt, Niger, Mali, Chad, Sudan) and to explore connections between North Africa and the Mediterranean or sub-Saharan Africa. Research may take place within the region, or be UK-based, depending on its nature. The next deadline for applications will be announced shortly. Travel Grants (up to £800): for exploratory research visits. This award is open to PhD applicants at UK universities, as well as applicants who hold a doctorate and are ordinarily resident in the UK. Pilot Project Awards (up to £3000): This award is open to scholars who hold a doctorate and are ordinarily resident in the UK. Team-based research awards (up to £7500): This award is open to scholars who hold a doctorate and are ordinarily resident in the UK. 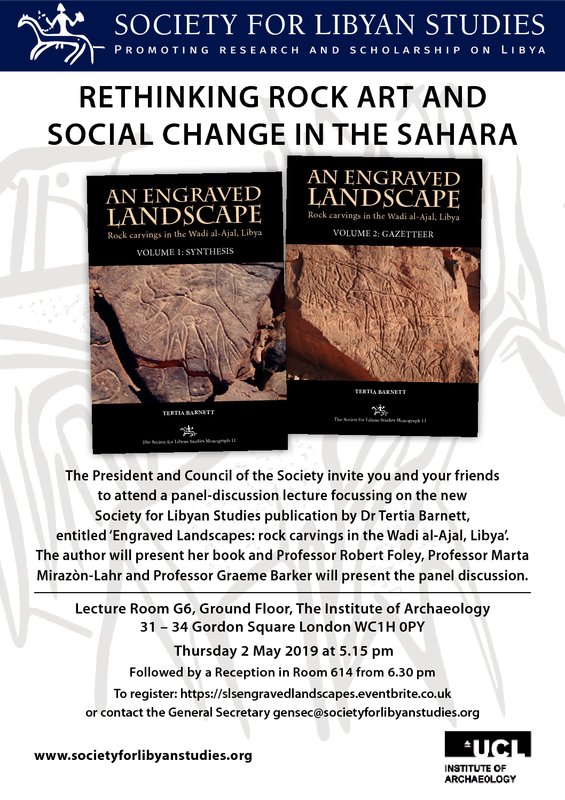 Society And Environment Across North Africa, From Deep Prehistory To The Present. Special calls for other research themes may be issued at other points in the year. The Society’s Research Grants Committee, led by the Chairman, Prof. Kevin MacDonald, is responsible for considering grant applications. Dr Saul Kelly is the external assessor. Travel Grants are for individual applicants making visits to the region or to North African archives to undertake self-contained projects or discrete elements of larger projects. These cover costs of travel and subsistence up to £800 for PhD students, academics and researchers undertaking reconnaissance tours or smaller research projects in North Africa. The Society particularly welcomes applications to support research in its archives at the University of Leicester. Applicants must be ordinarily resident in the UK, or registered for a degree at a UK university. The Society for Libyan Studies is able to offer a number of research grants, up to £3000 in value, as small grants for a discrete piece of publishable research or as seed funding for larger research projects. These are intended to support the publication of research as well as to enable undertake initial exploratory work or a feasibility study prior to making applications for major funding to a Research Council, the British Academy or another body. Awards may be used to cover travel, analytic work, or exploratory fieldwork and research. Applicants must be postdoctoral scholars ordinarily resident in the UK. The Society for Libyan Studies is able to offer a number of grants, up to £7,500 in value, which can be renewed. These grants are intended for projects involving a group of researchers and/or projects that are planned to continue for more than one year. Research may take place within the region, or be UK-based, depending on its nature. Grant applications may form a contribution to a larger project fund, in which case it should be clear which element is being funded. Grants may be dependent on the applicant’s success with other funding bodies. Applicants must be postdoctoral scholars ordinarily resident in the UK. Project affiliation provides a formal link with the Society for Libyan Studies for projects that are not SLS funded, but where our institutional support may be beneficial, or where affiliation may enhance the academic and research role of the project and the Society. The Society for Libyan Studies invites applications for project affiliation for postdoctoral research in the humanities and social sciences to be undertaken in North Africa. All applications should clearly demonstrate that SLS affiliation is sought for a clearly defined piece of research, which will have an identifiable outcome on completion. Please contact Pauline Graham, the Society’s General Secretary: gensec@societyforlibyanstudies.org for more information. Under exceptional circumstances the Society for Libyan Studies Council will consider applications outside the normal procedures and timetables detailed above. Please click here to read more about the conditions that may warrant such applications. For more information about individual Society-sponsored projects, in the first instance, please contact Pauline Graham.